A lead-off triple by Andrew Pfeiffer, back-to-back intentional walks and Mr. Clutch, Jake Backes, set up a thrilling, extra-innings, 6-5 win for the No. 3 ranked Trinity Classical Academy Knights over de Toledo Jaguars in the CIF-Southern Section Division 7 playoffs on Tuesday afternoon. In the eighth inning, with the crowd anticipating a big moment, Andrew, the Knights’ “rock,” according to teammate Judah Palmissano, took a couple practice swings, took a deep breath and stepped into the batter’s box. Rocketing a line drive into right field, Andrew took off down the first base line, rounding second he glanced over at third where head coach Mike Franchimone was signaling for him to slide. Sliding into first base, Andrew (who finished 3-for-4 with an RBI) laid on the ground in disbelief for a couple seconds before rising up with an ear-to-ear grin coupled with some fist pumps on his chest. The next two batters, Joey Andolino and Luke Pfeiffer, were intentionally walked, loading the bases for Backes. “You can walk them all you want,” Franchimone said. “Right now everyone is capable. They know how to shorten it up and they know how to put a ball in play. They have been taught it and they do it with excellence.” Backes looked over to his coach and the bench, took a couple swings and set up at the plate. “I can’t let my team down and everyone that came out to support,” Backes thought before his at-bat. “My whole team has fought this whole time for this one moment and I knew I couldn’t let them down.” Hitless heading into the at-bat, Backes did not disappoint. Connecting with a ball that he drove into left field, Backes lifted a single over the third baseman’s head. He brought in the winning run from third base, good enough for his third walk-off hit this postseason.cif Things started off rocky, but just like we are accustomed to seeing this season, the Knights found a way to pull out the win by getting key contributions from all players. Lone senior Andolino laid out for a blooper that went over the first baseman Carson Campuzano’s head, ending the fourth inning and saving a potential run. Palmisano added a diving catch for a bunt that popped up high in the air in front of home plate in the seventh. “I had to do it,” Palmisano said about the diving catch. “Drew was stressed out and I wanted to do everything I can to keep him calm. I do it for him because I know if I make that play he’s going to be more relaxed. 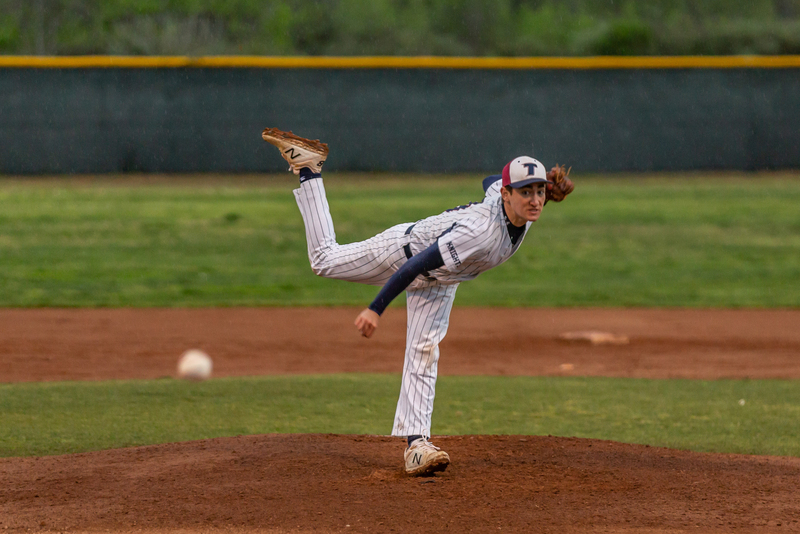 I do it for my team more than anything else.” Andrew went 3.33 innings, giving up zero earned runs on two hits and two strikeouts in relief for Palmisano. Palmisano started the game at pitcher and went 4.7 innings, giving up four earned runs on seven hits and struck out two before Andrew came on for relief. Calling Franchimone the night before the game, Andrew asked if they could talk about the game plan. “He says, ‘Coach I think we need to start Judah and I want to come in and close the game,’” Franchimone said. “Man, that was in the back of my mind, but now that I know you’re in, I’m in.” The decision paid off. In a complete team effort, making history with every game, the Knights have won fourteen consecutive games with the win against de Toledo and are headed to the Division 7 championship game where they will face off against Fillmore in Riverside at the Riverside Sports Complex on Saturday at 3:30 p.m.